In a February visit where U.S. religious leaders were told they were the first American delegation to meet face-to-face with a sitting Iranian president in Iran since the 1979 Islamic Revolution, Mennonite Central Committeeâ€™s Ed Martin saw an unexpected fruit of nearly two decades of MCC work in Iran. â€œI would have never dreamed that our work in Iran would lead to such a meeting. We usually work at a community level. Yet, through the relationships built up over the years, to be suddenly sitting in the presidential offices was amazing,â€ said Martin, who is director of MCCâ€™s Central and Southern Asia programs and has overseen the Iran program for 17 years. MCC began working in Iran after a devastating earthquake in 1990, providing the humanitarian aid the organization is known for. Through years of work on other relief projects, as well as a student exchange program founded in 1997, MCC built networks of ties that led to the February delegation. The 13-member group of U.S. religious leaders, co-sponsored by MCC and American Friends Service Committee, included representatives from the United Methodist, Episcopal, Catholic, Mennonite and Quaker churches as well as representatives of Sojourners/Call to Renewal, Pax Christi and the National Council of Churches. They were in Iran Feb. 19-25 and plan to visit U.S. policymakers in Washington, D.C., on March 6-7. Having leaders of other groups, such as the United Methodist Church and Sojourners, really multiplies the impact of the visit, said J. Daryl Byler, a delegation member and director of the MCC Washington Office. â€œThey represent huge networks of people, and they can share the experiences through those networks,â€ Byler said. Delegation members from MCC say they are encouraged by the conversations they had with leaders in Iran, that they will continue work to call U.S. government leaders to meet with Iranian leaders and that they hope U.S.
Christians continue to pray for and remember Iran and its people. And they find themselves reflecting back on how long-term MCC work led to ground-breaking conversations. Delegation leader Ron Flaming, MCCâ€™s director of international programs, said as the delegation met with leaders in Iran, he was struck by the realization that how Iranians view the countryâ€™s history differs sharply from how most Americans would view it. For Iranians, the overthrow of a democratically elected government in 1953 and the installation of the Shah by the U.S. government was a sore point, as was U.S. support for Saddam Hussein during the Iran-Iraq war in the 1980s. The delegation met with Iranian leaders who described the Shah as a brutal dictator known for his opulent living. The overthrow of the Shah, from this point of view, was a liberation movement. â€œI think the delegation was keenly aware we sat between these two narratives and found how difficult it was to make the bridge,â€ Flaming said. On the other hand, Iranian religious leaders spoke passionately of the need to work for peace. An Armenian Evangelical pastor said even small steps are important. Sometimes in building a bridge, he told them, you must begin with placing a few pebbles to start a foundation. â€œThe other impression I got over and over again is the Iranian people feel they are not respected,â€ Flaming said. He said Iranians asked delegates to consider the countryâ€™s track record. â€œThey say with some intensity that they have never invaded another country, have never used weapons of mass destruction even though Iraq used them against Iran,â€ Flaming said. Iraq used chemical weapons in the Iraqi-initiated war with Iran in the 1980s. Flaming and Martin said the group was told over and over again that Islam prohibits the development, stockpiling and use of any weapons of mass destruction. â€œWhile it doesnâ€™t guarantee Iran would never develop a nuclear bomb, it makes it clear thereâ€™s a very strong public and religious consensus against it,â€ said Flaming. As the delegation learned about Iranâ€™s ancient culture and its emphasis on education, they also found that Iranians, from religious leaders to the President, were well-versed in Christianity. One of the inequalities that Martin has noticed in years of working at Christian and Muslim relations is how much Muslims know about Christianity, Jesus and the Bible â€“ and how little most Christians know about the Quran. â€œIf weâ€™re going to have serious dialogue, weâ€™re going to have to know more about the Quran,â€ Martin said, noting scholars heâ€™d met in Qom who have read the entire Bible several times and can readily recite from it. The group released a statement calling on the U.S. and Iranian governments to immediately engage in direct, face-to-face talks and to cease using language that defines the other using â€œenemyâ€ images. â€œOur two governments need to find a way to engage each other, and thatâ€™s critical. If that doesnâ€™t happen, the current tensions are not going to get resolved,â€ Flaming said. Delegates came away convinced they needed to work diligently to call on the U.S. government to talk to Iran about the current tensions between the two nations. They are also hoping that Christians in the U.S. will contact their lawmakers to express their desire for talks between the U.S. and Iran. â€œIf governments arenâ€™t talking then itâ€™s still a very dangerous situation,â€ Byler said. Two days after the delegation returned, U.S. Secretary of State Condoleezza Rice announced that the United States will participate in Iraqi-led talks with Syria and Iran, to seek ways to stabilize Iraq. 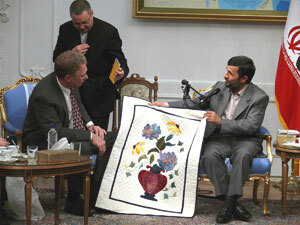 “This could be a good first step toward direct bilateral talks with Iran on a range of issues,” said Byler. The delegationâ€™s statement, which is online at www.irandelegation.org, also calls on governments of the two countries to promote more people-to-people exchanges including religious leaders, elected leaders and civil society. Any points of contact can help lay the foundation for relationships and peace, Flaming said. In addition to contacting lawmakers, U.S. Christians are invited to pray for the people of Iran and its leaders. The group took small ceramic oil lamps, along with wall hangings, to give as gifts. â€œWe told people the lamps are a symbol of our commitment to remember the Iranian people in our prayers at this time,â€ Flaming said. For years, MCC workers in Iran have known that small gestures of gratitude, thoughtfulness and welcome can mean a lot. On this delegation, Flaming gave the President a note from sixth-graders at Akron Mennonite Church, saying they were praying for the President and for peace between the two countries. It made a visible impact on the president, and he said he would like to write a response to the children. Flaming noticed that when delegates gave the gift of a handmade wall hanging, peopleâ€™s faces lit up. â€œThat was the time in the conversation where they were the most animated â€“ the twinkle in the eye, the warmth in the smile, the firmness of the embrace,â€ he said. MCCâ€™s involvement in Iran began with the giving of gifts of another kind â€“ material aid for people caught in a devastating earthquake in 1990. MCC worked through Iranian Red Crescent Society and later worked with the Iranian governmentâ€™s Housing Foundation to construct 15 village health clinics in earthquake-affected areas. MCC workers in 1991 served in an Iraqi refugee camp in western Iran, reaching out to some of the more than 1 million Iraqi refugees from the Persian Gulf War. MCC has also worked with Afghan refugees in Iran. In 1997, MCC began a student exchange program to bring U.S. or Canadian Mennonites to study in Qom, Iranâ€™s holy city, and Iranians to study in Ontario. As Martin set up the program, people told him they knew about MCC because of its work with the Red Crescent Society. MCC began to sponsor Iranians to attend the Eastern Mennonite Universityâ€™s Summer Peacebuilding Institute (SPI). In September 2006, MCC was asked to organize a meeting in New York of U.S. religious leaders and the Iranian president â€“ an unexpected outgrowth of the relationships that had been built one-by-one over nearly two decades of work. And now, as delegates go back into their communities, Flaming is cheered by how MCC has built on those relationships with this delegation, widening the ties between the people of Iran and the United States. â€œThere is something that feels good about being able to broaden the net, to welcome the broader church on the journey with us,â€ he said. Thank you MCC for representing me (us) in these peacemaking efforts. Thanks for the reminder to pray for Iran and its leaders and people.